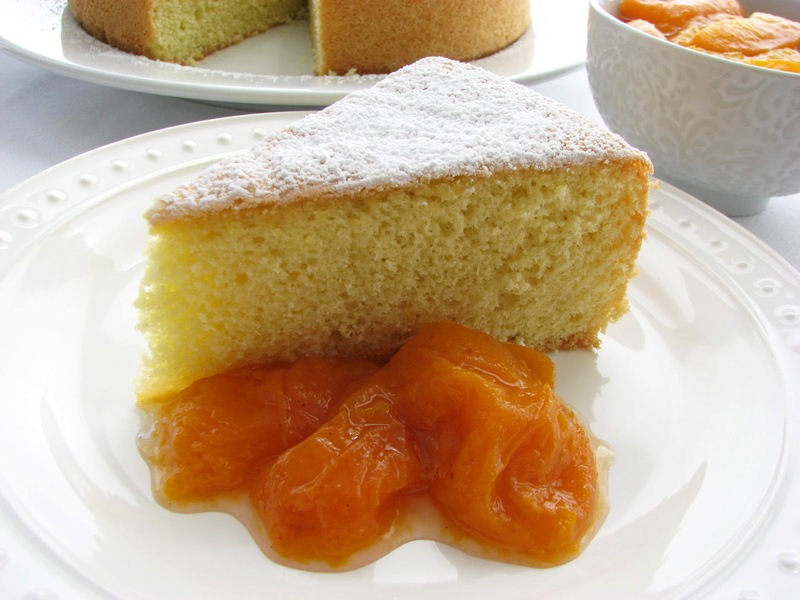 Sponge cake is a basic pastry tool to add to your repertoire, a light cake to soak up all those delicious juices from our luscious fresh fruit of the spring and summer season. It's also used to create trifles, charlottes, simple jam cakes or tiramisu. So it's a good versatile cake to master. Yet a lot of bakers aren't very comfortable working with genoise or sponge cake recipes because they can sometimes be fussy to produce. However, this recipe is one of the easiest cakes I've ever made. With just a few ingredients and the substitution of olive oil for butter, it assembles in no time and bakes off beautifully with no collapsing or excessive dryness. The key to success with sponge cakes, or foam cakes as they are also called, is beating the eggs. Because there's no leavening in the cake, a lot of air must be beaten into the eggs and sugar until the mixture reaches a ribbon stage, which is a thickening of the batter and a tripling in volume. You test for the ribbon stage by stopping and lifting the whisk up and if the batter streams down from the whisk and forms a cascading ribbon on the surface that holds for a few seconds, you're there. This method ensures a maximum of air is beaten into the egg and sugar mixture so the structure of the cake will be stable. This recipe has a bit of a different approach to both ingredients and method. Most sponge cakes call for cake flour for a very delicate crumb. This cake uses all-purpose flour, which I think may help to keep it sturdy. Once the ribbon stage is reached, the olive oil is slowly drizzled into the mixer rather than the classic method of folding in the fat at the very end. The cake bakes in the standard 25 - 30 minutes in a 350 degree oven. Once it's placed on a cooling rack after 10 minutes, the ring of the springform pan is removed and the cake is cooled completely. If you haven't had success with foam cakes before, I suggest you try this one. Since we're now luxuriating in apricot season, I thought it would be fun to pair this cake with a simple honey and vanilla apricot compote and cream. Fresh strawberries, raspberries, blackberries, peaches or any fresh fruit would also be perfect. Just macerate the fruit in sugar to produce some delicious juices. This pastry is called a "sponge" cake because it's usually imbibed with a liquid. For the purpose of my photographs, I left the cake as is so you could see the beautiful crumb, but be sure to serve the cake with plenty of compote syrup and cream. - For best success with cake, eggs should always be at room temperature. - When baked, this cake rises to the top of the pan, so be sure you're using a pan that is at least 9" x 2 1/2". - The original recipe is presented by weight, which I've included here. - The instructions are for a stand mixer. If you're using a hand mixer, it will take a bit longer to get the eggs and sugar to the ribbon stage. Just keep checking once you think you're there. I lift the beater about 6" and scrawl out my initials. If they hold for a moment by the time I've finished, it's ready. - I added 1 teaspoon of vanilla and 1/8 teaspoon of salt to the recipe as written, which are necessary to add flavor to the cake. Or you can also add 1 tablespoon of brandy or rum or the zest of one lemon or orange or a dash of good almond extract. - Folding the batter means running your rubber spatula around the sides and the bottom of the bowl and gently making a cutting motion through the center of the batter, while rotating the bowl with your free hand. The goal is to incorporate dry ingredients without sacrificing the airy loft of the batter. - Simmer the apricots on very low heat to preserve their flavor and texture. They made need next to no cooking if they are very ripe. - You can prepare the apricots ahead of time. Store the fruit and the syrup separately in the refrigerator. 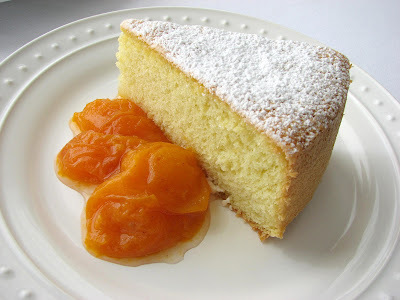 - Sponge cakes are often imbibed with simple syrup combined with a flavoring. Bring 3/4 C water and 1/2 C sugar to a boil until sugar is dissolved. Add liquor, liqueur, lemon juice, coffee or other flavoring, to taste. When the cake has cooled, use a pastry brush to apply the syrup to the surface. Repeat until the cake is moist. When you press your finger into the surface of the cake, there should be a little bit of liquid that comes to the surface. Whisk the flour and salt together. Using a stand mixer, whisk the eggs for about 3 minutes until pale and thickened. Add the sugar slowly and continue whisking on medium high speed until the mixture triples in size. This will take 5 - 6 minutes. It should be thick, pale and foamy and leave a ribbon trail that holds for a few seconds when you lift out the beater. Continue to whisk while you add the olive oil a few drops at a time. Add the vanilla. Take off the mixer and sift 1/4 of the flour onto the batter and fold in gently with a rubber spatula. Continue sifting with 1/3 of the flour into the batter and folding, then half until it's all been added. Be sure to thoroughly scrape the bottom and sides of the bowl and fold only until you no longer see any streaks of flour. Pour into the prepared springform pan and bake for 25 - 30 minutes until the cake is golden and springs back when lightly touched with your finger. Remove from the oven. The cake should immediately begin shrinking away from the sides of the pan. Run a thin knife around the edges to free any areas that may be sticking. Cool in the pan for 10 minutes, then turn out onto a wire rack. Carefully remove the parchment and cool completely. For the compote, cut the apricots into 1/2" slices and discard the apricot pits. Combine water, sugar and honey in a saucepan. Split and seed the vanilla bean and add both. Bring to a slow simmer and add apricots. Cook on low heat for about 5 minutes or until the apricots just begin to become tender. 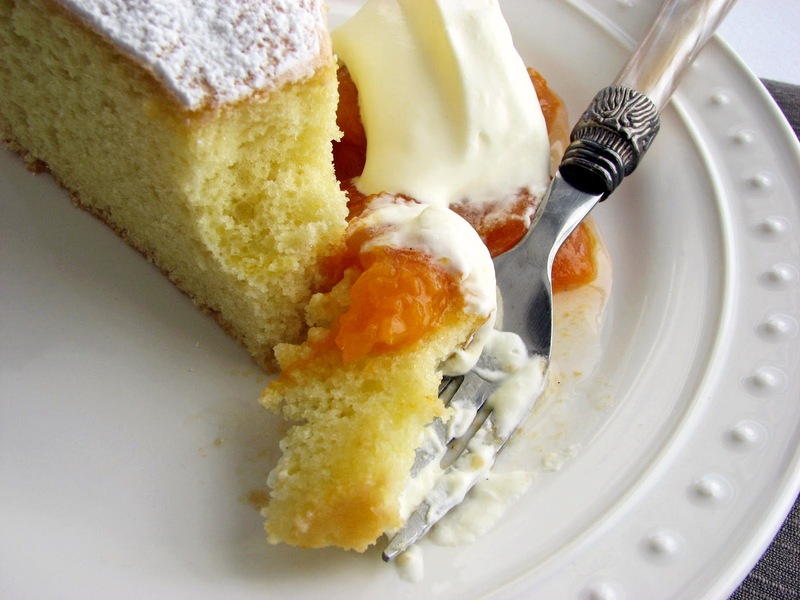 Using a slotted spoon, remove the apricots to a bowl. Turn up the heat and reduce the syrup by half. Stir in lemon juice and cool. Whip the heavy cream, sugar and vanilla to very soft peak. 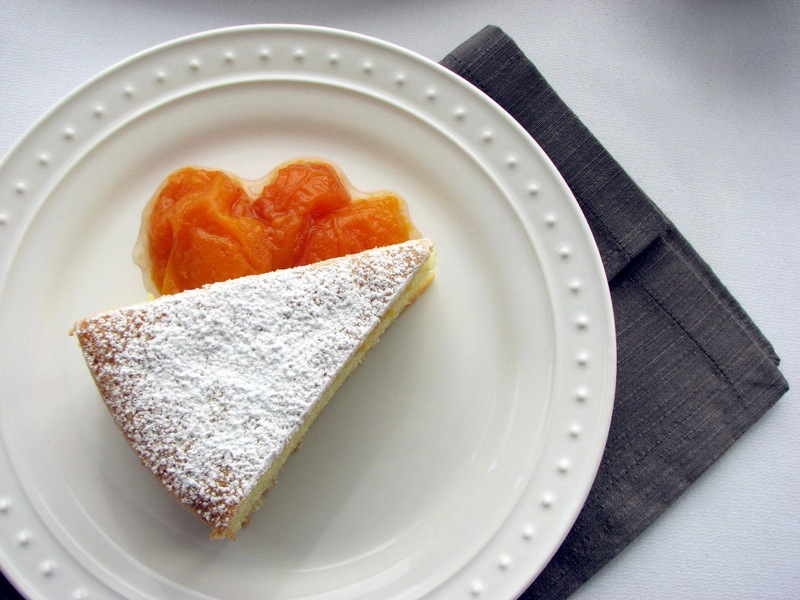 To serve, dust the cake with powdered sugar and garnish each plate with fruit, a generous portion of syrup and a dollop of whipped cream. Goodness. I love olive oil cakes. I've never had a spongy one. :) I look forward to trying this! There were apricots in the market here last week, but you know the kind of luck I've had with apricots around here. None. So maybe I'll drool over the apricots and use strawberries or raspberries, which are out in full force and delicious! I love this time of year, when apricots start appearing in the markets. Your blog introduced me to the idea of olive oil cakes and now I'm addicted - this looks like a lovely unusual one to try! Plum, I hope you find this cake an easy one to prepare. Victoria, this would be great with strawberries or a good mix of berries with lots of sweet juices. Elly, hope you are enjoying the bounty of spring and I'm so happy to hear you're hooked on olive oil cakes! They're pretty simple but delicious. Hi P.S.! I have been gone from your blog for way too long! This looks so lovely and I love that it is a twist on traditional olive oil cakes. Good apricots are hard for me to find here, but this would be great when our Colorado peaches are in season. Thank you! Hello, Sharon T, and welcome back! Peaches would be terrific alongside this cake. Hope they arrive soon! CUESA said recently how this (odd) Spring was perfect for stone fruit like Blens coming up in a few weeks and Morellos early next month. Personally, I can't wait, it's pretty exciting. I love olive oil desserts and cakes especially, and was happy to try this one. I think I worked out the kinks so I'll be ready to try it again when Blens are back. Next time I'll be more careful with total baking time-- it's nothing a light cake wash couldn't fix this time around-- but I really liked this cake. we're entering winter here in hobart, australia, so sadly no ripe apricots anymore! but i am intrigued by this cake - i've never made such a thing! you've inspired me to try this - perhaps with stweed apples, instead. Hellooooo e / dig in! Nice to hear from Australia. The simplicity of this cake makes it your personal canvas. I think any sort of fruit or a cloak of chocolate or caramel or simply some brandied or spiced cream would be wonderful. The sky is the limit. Hope you try it and enjoy it as much as I did! Hey, Bryan! OOooo, Blens and Morellos, yummmmmmm. I'm wondering if your cake baked faster or slower? well i probably got a little too fussy and tried to use cake strips which added to the bake time. based on how the cake rose with the strips, i'd say they were unnecessary. next time i'm making the cake without strips. Ah, I see. Thanks for the explanation. I've baked a ton of sponge cakes in my time but when I baked this cake I was pretty surprised at how much it rose and how stable it is once it cools. The crumb is also more defined. Coming to this a bit late, but... while I love olive oil, may I make another Mediterranean-inspired suggestion? We pour the oil off of raw tahini (sesame paste) and use that for baking and stir-fry. It's not as strong as the toasted sesame oil that comes in the bottle. Just a nice, clean, nutty taste. You could probably get away with using some of the sesame paste itself, just beat the batter some more. Ben David, your suggestions are always welcome. I must put that in my file of things to try because I'm intrigued by the idea and wonder how the flavor would work. Not sure about adding some paste to the batter as it would probably really change the texture of the sponge but a bit of it for flavor might work. Thank you! Do you think I could use a regular 9 inch cake pan? Hi Rhianna. Yes, definitely. Just be sure to grease it and if you have parchment, line the bottom of the pan. Parchment always makes it easy to remove a cake. - When baked, this cake rises to the top of the pan, so be sure you're using a pan that is at least 9" x 2 1/2" tall. 1 - You can flavour the cake with some orange/lemon zest and a spoon of juice, but the zest alone will work. Citrus flavour combine beautifully with Olive Oil. a) French method: warm the egg and sugar mixture to body temperature (use a bain-marie or just whisk constantly in very low stove fire until it is around 30-35 C, or like the temperature of your finger when you put it in the mixture) and transfer to the mixer bowl and beat for the recommended time (I like at least 12 minutes on MEDIUM speed in a stand mixer). b) Most used in Portugal: by separating the eggs and either beating the yolks with sugar until ribbon stage and than folding in whipped whites alternating with 1/3 of flour; or whipping the egg whites with the sugar (thus making meringue, do feel free to add the salt here and some lemon juice droplets), adding the yolks slightly beaten with the olive oil (if using) by spoons, followed by folding the flour in 3 batches. I like to use this last one for simplicity and commodity. Thank you for your ideas and for the information from Portugal, Jorge. Yes, these are various methods you learn in pastry school. The b) method you mention is like the one we use to produce a "biscuit" (pronounced "bisqwee") sponge cake. I hope Americans try these cakes because they are super light and very versatile. Jai une belle huile d'olive forte que j'ai utiliser pour cette recette. Sa former une belle génoise bien léger mais à mon avis ca manque le goût de huile d'olive que je cherche. Quelqu'idees?